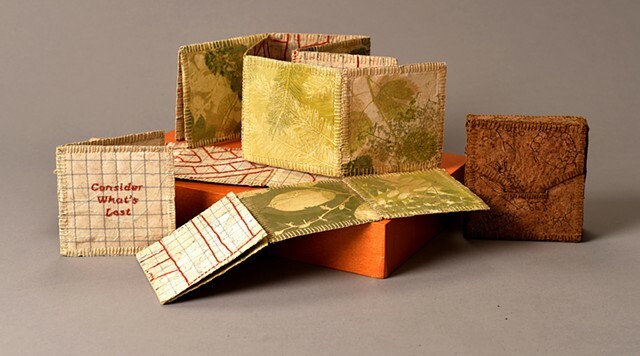 Meander Book and Accordion Book: Handmade Kozo Paper embedded with shredded U.S. Currency, original monoprints and embroidery thread; Case: Rhubarb, and Gampi paper and embroidery thread. Living in rural Cooper Point in Olympia, Washington for over 40 years, I have watched the forests and fields fragmented by new housing developments and mega estates. New folks move in without knowing much about the native plants and animals who depend on the forests, fields and clean water. This pattern is repeated all across Puget Sound as people cement driveways, plant lawns, remove the forest understory to make their land look like a park, suffocate tree roots with power rider mowers, use pesticides and fertilizer, and introduce invasive species. In my work, I hope to inspire new neighbors to plan their landscaping to support native plants and animals.